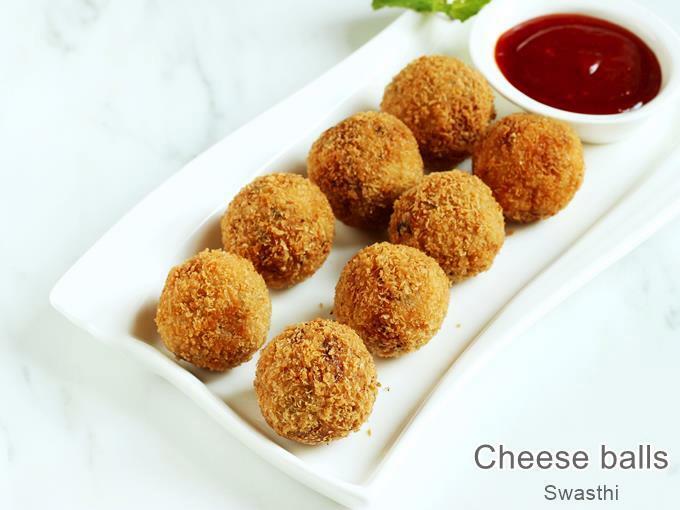 Cheese balls recipe – These delicious crispy potato cheese balls make an awesome party snack. 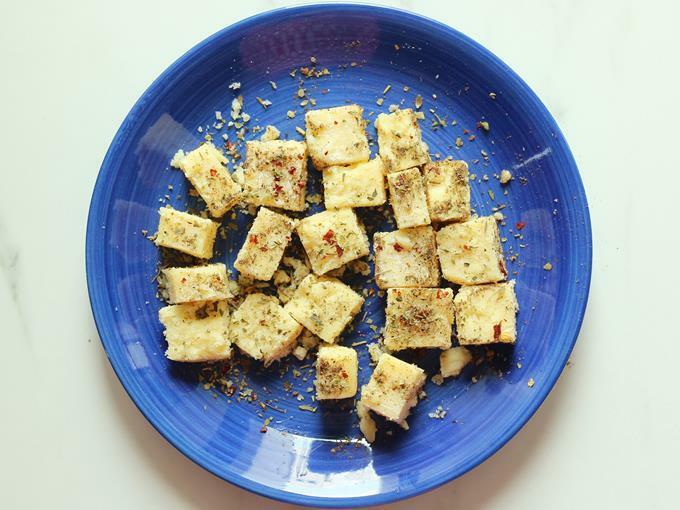 These are flavorful, addictive and will be loved by kids and grown ups alike. Cheese balls can be made in many different ways. 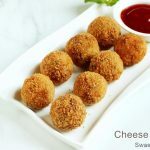 The recipe shared here is super quick to make and the cheese balls can be deep fried, pan fried or even baked. 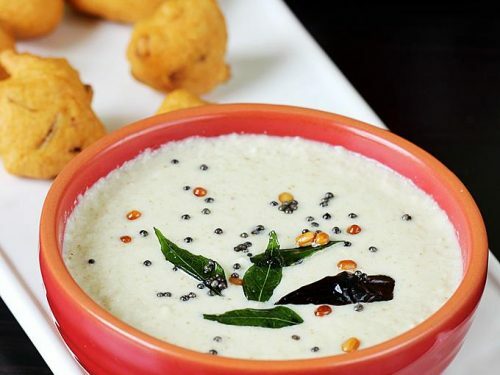 You can serve these without any dip, sauce or chutney as they are flavored well and mildly spiced. 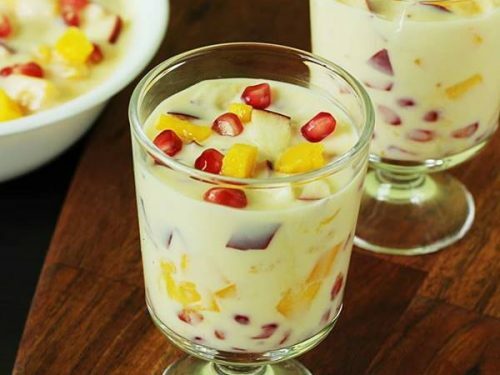 This is one of those recipes which I have made many times for my kids and it has never disappointed them. 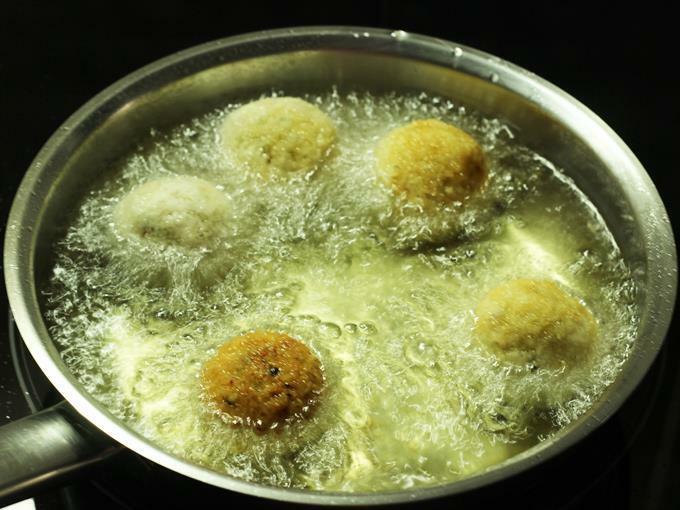 In this post, I have shown deep frying the cheese balls but I usually bake them in the oven and sometimes even pan fry them. 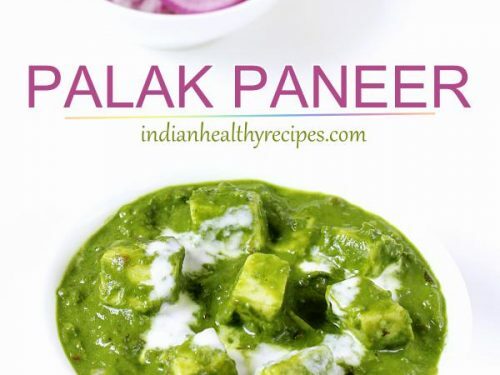 I have shared more instructions in the recipe card below. There are many different ways of making cheese balls. 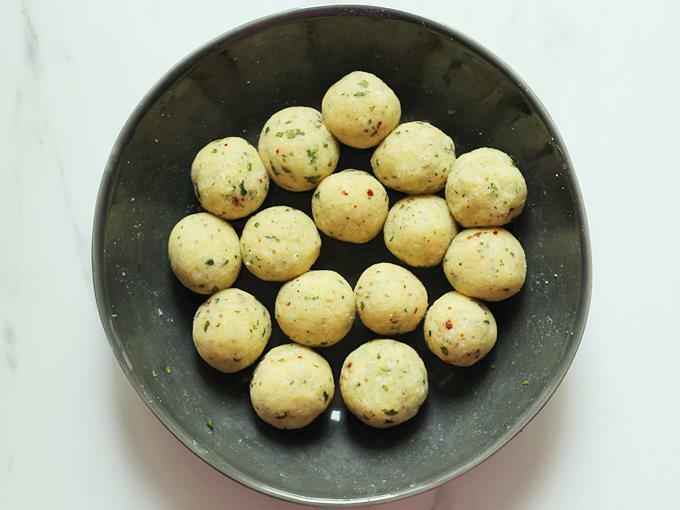 These are lightly flavored & spiced cheese stuffed mashed potato balls. 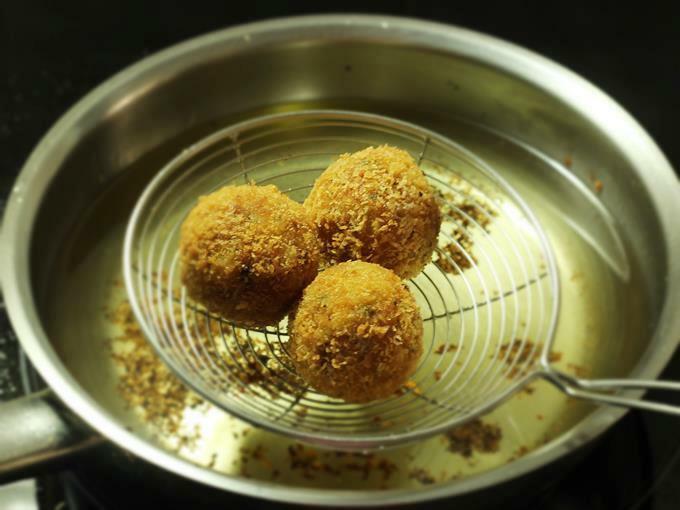 These balls are then breaded and fried to get a crisp coating. 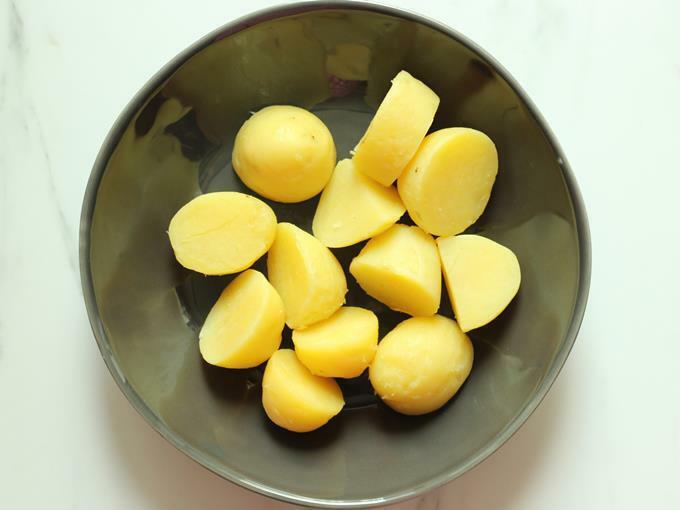 1.Boil potatoes just until done without making them too soggy or mushy. Over cooked or soggy potatoes will need more bread crumbs to absorb the moisture. This alters the taste of the covering. 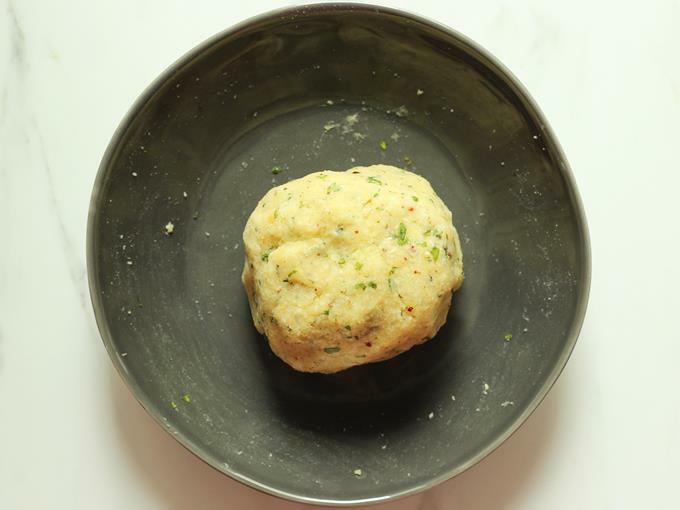 2.I have flavored the cheese balls with pepper, red chili flakes, Italian herbs and allspice powder. 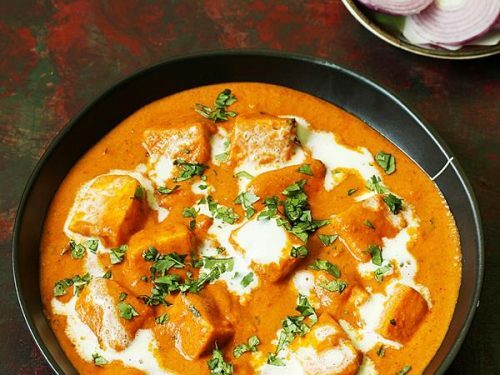 To give an Indian touch you can just use kasuri methi and garam masala. But the combination of herbs & spices I use lend exceptionally flavorful and the best potato cheese balls. 3. I have used cheddar cheese. However you can replace it with mozzarella cheese. 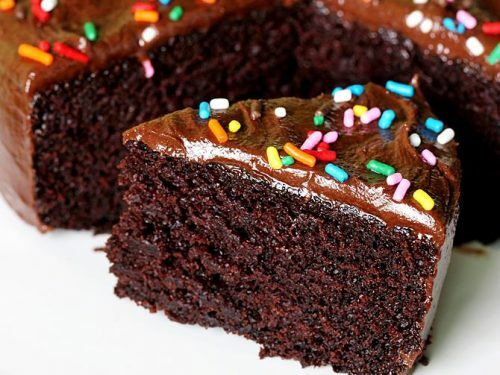 How to make these healthier? 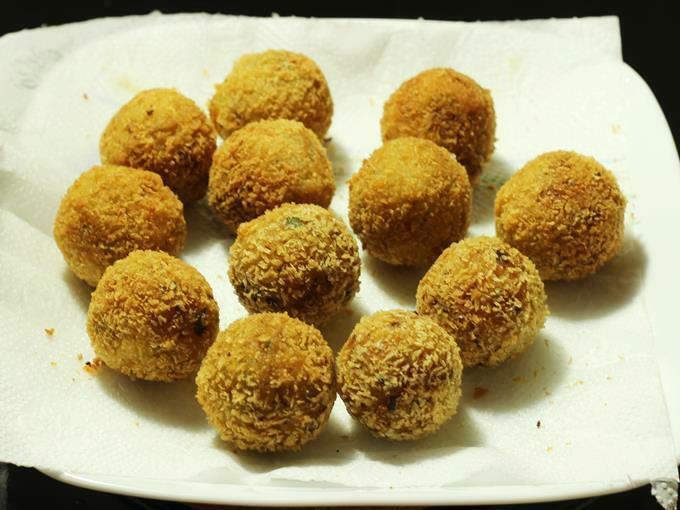 1.If you do not prefer breaded snacks then skip rolling the balls in bread crumbs. Just roll them in corn starch and fry or bake them. 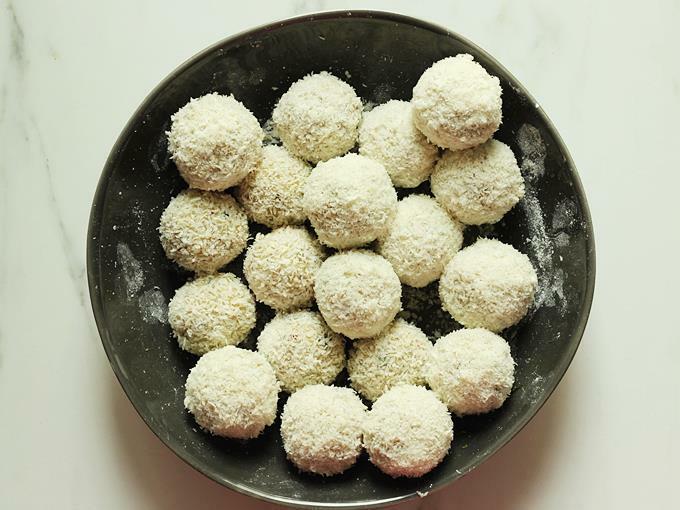 2.For healthier option, I make these cheese balls by avoiding bread crumbs completely. 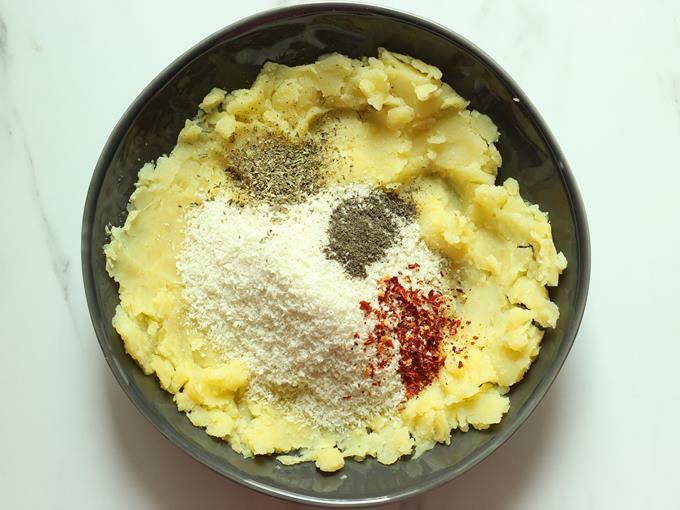 I use coarse poha powder for the potato mixture as well for the crust. To make your own poha powder, just pulse the thick or medium variety poha in a blender jar. The powder must be like fine rava or suji. 3.To avoid corn starch, just replace it with any other whole grain flour. Just make sure the flour is very fine or smooth. 4. Avoid deep frying and bake them at 200 C in a preheated oven for 15 mins. 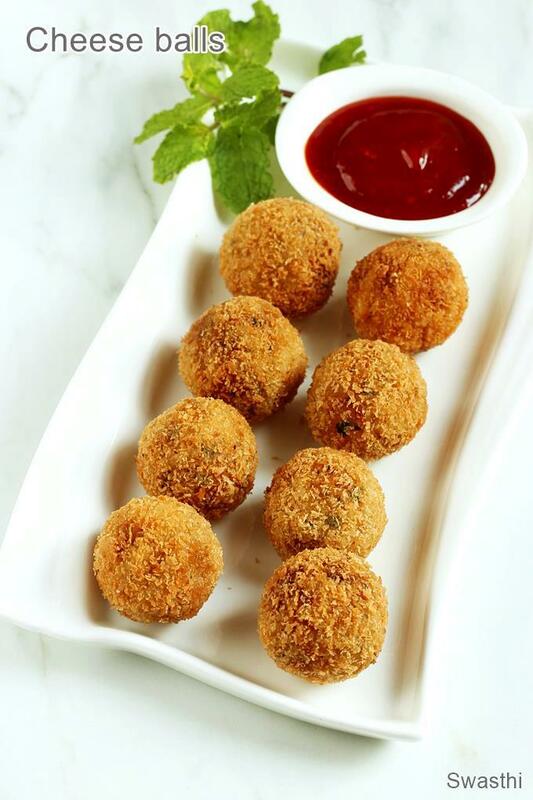 Crispy cheese balls that are easy to make, taste delicious with great flavors. These potato cheese balls make for a great party snack. 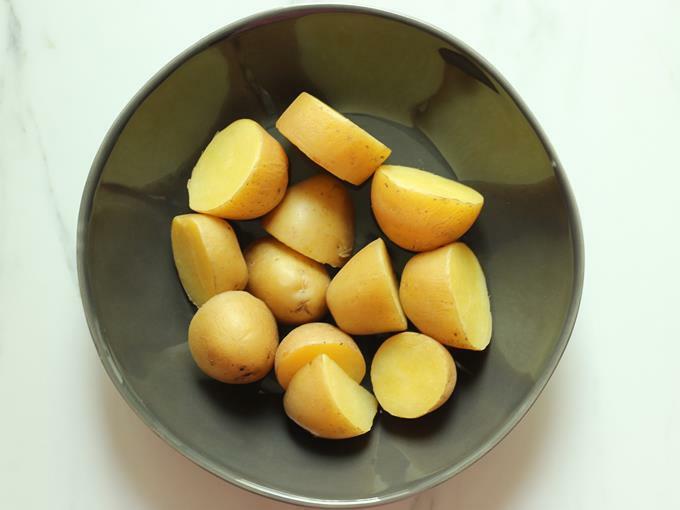 Boil potatoes with the skin on until al dente but fully cooked. They should not be too mushy. 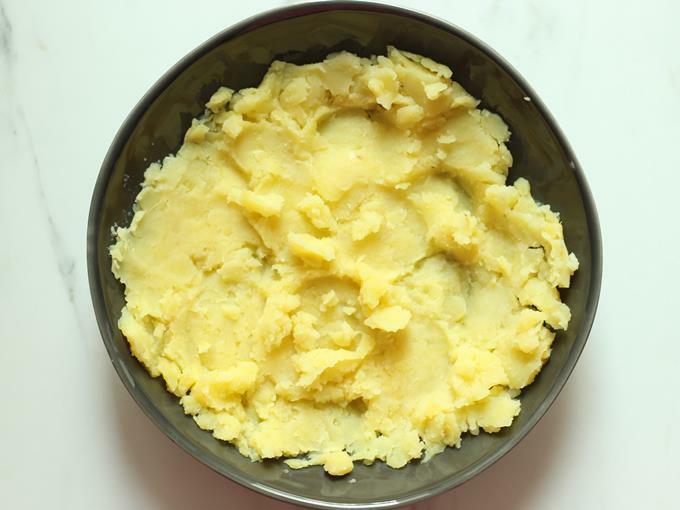 Remove the skin and mash them well until smooth with a masher. There should be no lumps. 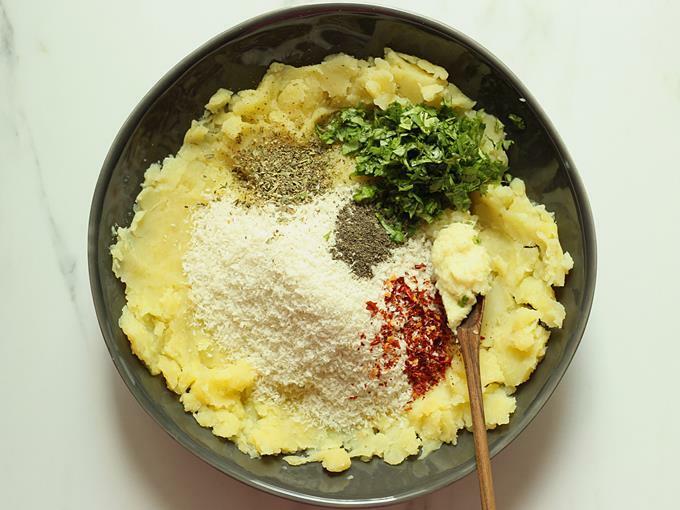 Add garlic paste, herbs, coriander leaves, salt (very little), chili flakes, pepper and bread crumbs. Mix them well and make a ball. The mixture must bind together and should not be sticky or too dry. Divide the mixture to 8 to 10 equal sized balls. 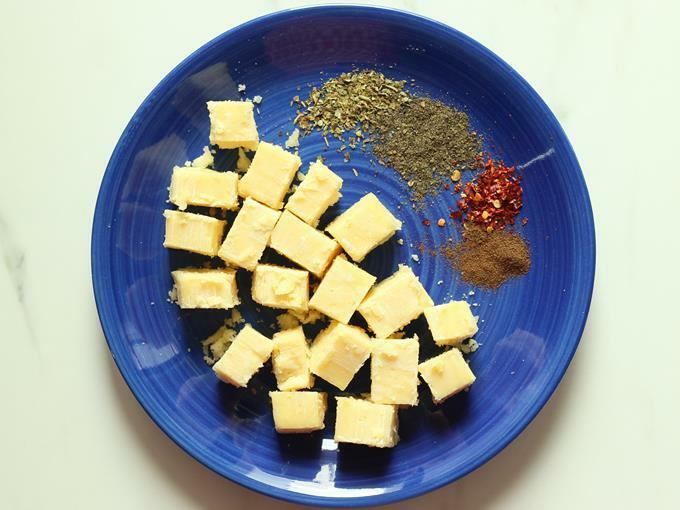 Cut the cheese to ½ inch cubes. Mix together herbs, chili flakes, pepper and spice powder. Toss the cheese in this mix. Set aside. 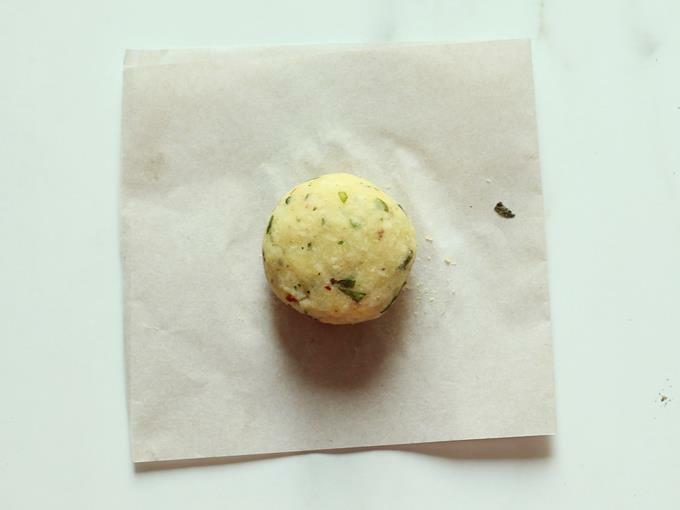 Take a potato ball and spread it evenly to a small patty in your palm. Place a cheese cube in the center. Gently bring the edges together to make a ball. Ensure the ball is sealed well without any cracks. Add 2 tbsps corn flour to another wide plate. Spread it. Roll the finished ball in corn flour. The same way make all the cheese balls. If you do not prefer to coat them in bread crumbs, you can pan fry these straight away. Transfer ½ cup bread crumbs to a separate plate. Add 2 tbsps corn flour to a bowl and mix with 3 to 4 tbsps water. Make a thin mixture. Alternately you can also use a beaten egg. 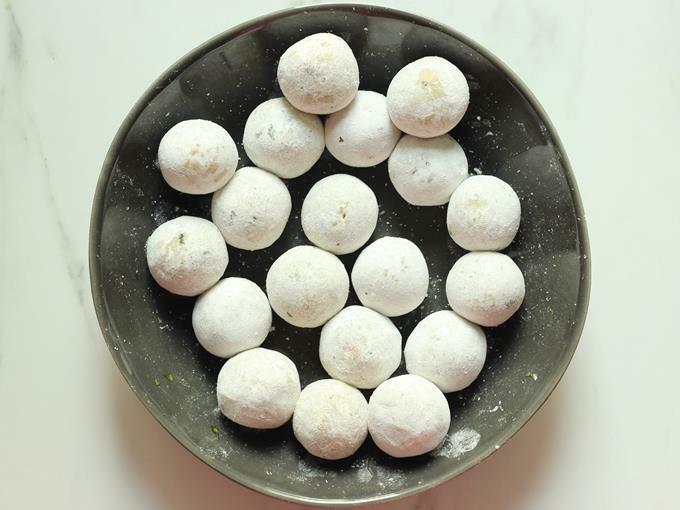 Drop each ball in the corn flour mixture or egg and make it moist. Immediately roll it in bread crumbs. Set this aside in a plate. Finish making all the balls. Double bread the cheese balls – Repeat the same steps of dipping in flour mixture and then coating the bread crumbs again. Set aside in a plate. Rest them for 10 mins. To a wide deep pan pour oil just enough to half immerse the cheese balls. Heat the oil on a medium flame. Drop a small piece of the potato mixture to check if the oil is hot enough. It has to come up immediately without browning. This is the right temperature. Regulate the flame to medium. Next drop the balls one by one & do not disturb them for half to 1 min. Gently stir them and fry until golden and crisp. Serve potato cheese balls hot with any dip or sauce. To bake – Preheat the oven at 200 c and bake them for 15 mins on a parchment paper or greased foil. Adjust the timings as needed. 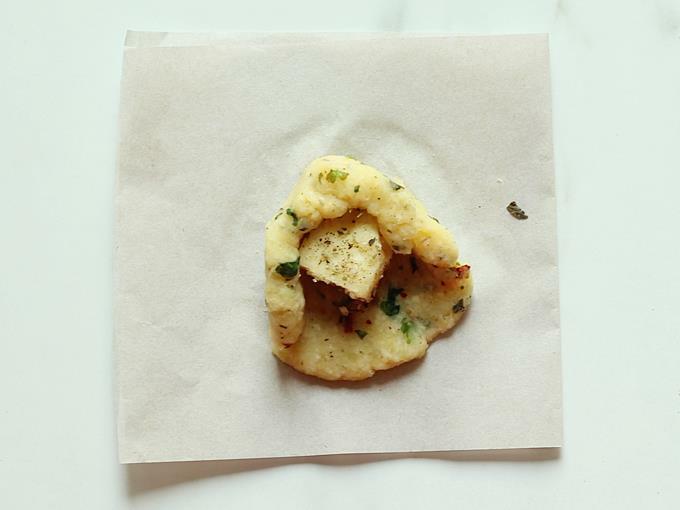 You can pan fry them in 2 batches using 2 to 3 tbsps oil per batch. Some amount of bread crumbs will come off the balls and it is just okay. They will still be good. To avoid breakage of the balls spread the potato patty evenly and roll it gently. 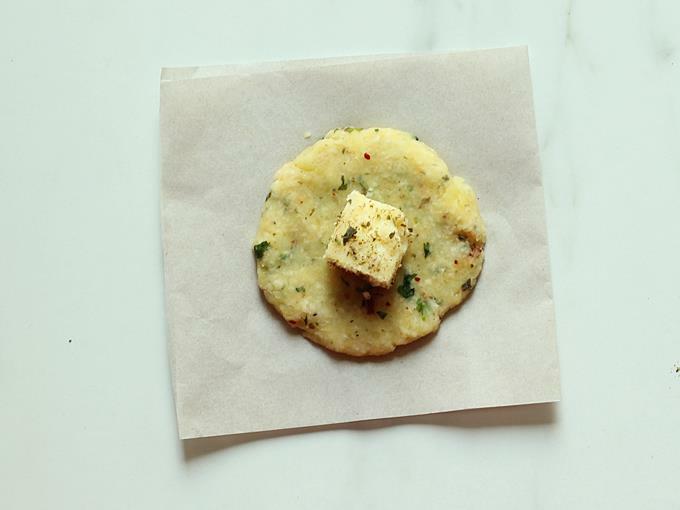 An evenly spreaded patty and evenly rolled ball will not mess up the cheese while frying. If the cheese is not covered well with the potato mixture then the cheese may come out to the oil while frying. Cheese balls may break if disturbed immediately after adding to oil. 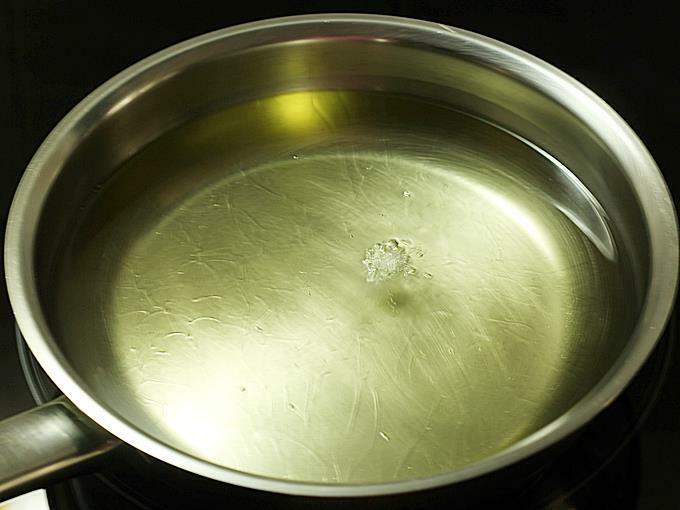 If you listen to a crackling noise while frying, quickly remove the ball from oil and keep it separately. Fry it towards the end to prevent messing up the oil. I have doubled the above recipe, so the quantities in the pictures will not match as mentioned. 1. Boil the potatoes in which ever way you like. I prefer to boil them in a pot with water enough to cover them. This way they don’t turn too mushy or soft. It is good to keep the skin while boiling as it prevents them from turning mushy. 3. Mash them well. There should be no balls or lumps of potato. The mashed potatoes must be smooth. To prevent lumps you can also grate and then mash them. 4. Add the bread crumbs or powdered poha. Then the dried herbs, pepper and red chili flakes. Also add in little salt. Do note that cheese is salted so you will need very less salt here. 5. Then add garlic or ginger garlic paste and coriander leaves. 6. Mix together everything and make a ball. The mixture must be non sticky and not too dry. 7. Divide the mixture to 8 to 10 balls. I doubled the recipe so I got 18 balls. 8. Cut the cheese to 1/2 inch cubes. To a plate add the seasonings. I used allspice, red chilli flakes, pepper and Italian herbs. I used cheddar cheese but made it several times with mozarella too. Use what ever you like. 9. Mix all of them and sprinkle it over the cheese. 10. Place a potato ball on your palm. 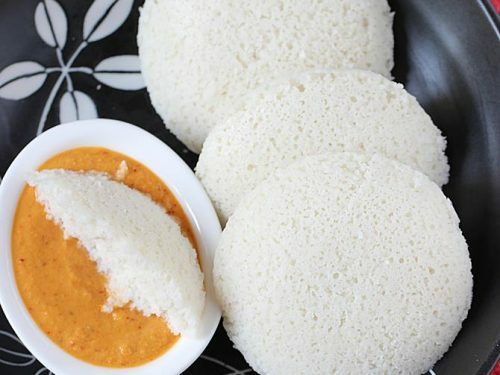 Spread it evenly to a small discs or puri. Do not spread it too thin else the cheese may come out while frying. Place 1 cheese cube in the center. 11. Bring the sides together to cover the cheese. The potato mixture may break but it is okay. Just roll it up gently. 12. Make a round ball. 13. 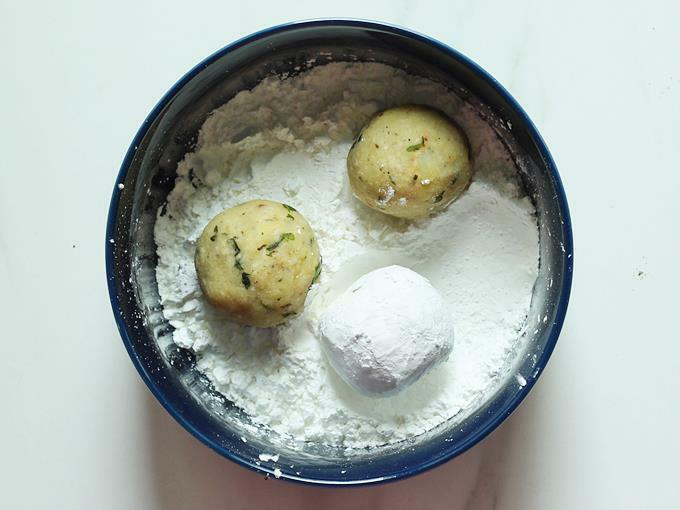 Add 2 tbsp of corn flour to a bowl and roll the balls in the flour. 14. This way roll all of the balls and rest them aside for 10 mins. 15. Pour 3 to 4 tbsps of water to 2 tbsps of corn flour and make a uniform mixture. Alternately you can also use beaten egg. Transfer bread crumbs to a plate. 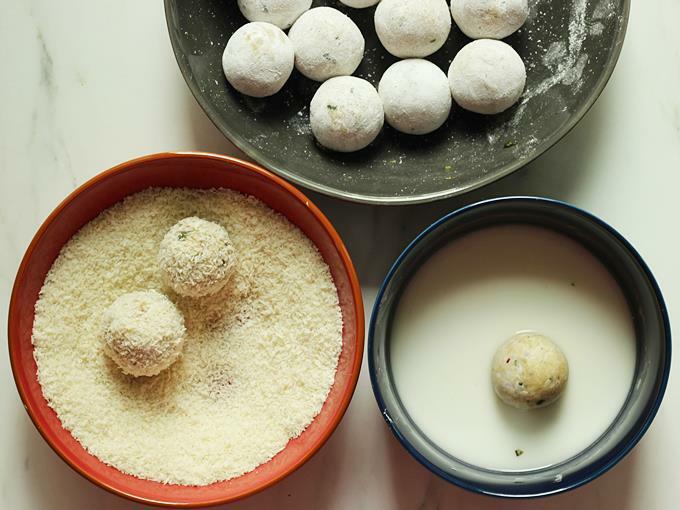 Dip each ball in the cornflour mixture and then quickly roll them in the bread crumbs. 16. I prefer to repeat dipping the once breaded cheese balls in the cornflour mixture and then roll them in the bread crumbs again. This way they turn extra crisp. You can also bake these or pan fry them, instructions in the recipe card. 17. Heat oil in a wide, slightly deep pan just enough to half cover the cheese balls. Check the oil if it is hot enough by dropping a small portion of potato. It has to rise immediately without browning. 18. Regulate the flame to medium high. Gently slide the cheese balls to hot oil and do not disturb for 30 to 60 seconds. Stirring them immediately may break the balls. 19. Fry until golden and crisp. Discard the used oil. 20. Remove them to a kitchen tissue. You are welcome. Thanks for trying. Yes I will share the recipe of manchow soup. Yes you can. Just bring them to room temperature before frying or baking. I made these for a small kids party. These cheese balls were an awesome thing to welcome the kids. They vanished in no time. Fabulous recipe. Thanks very much for making the event special. I also made your egg toast and carrot pudding. You are welcome. so happy to know the food turned out good. Thank you so much for the comment. You made my day !